19 Awesome Free Graphics Resources You’ll Thank Me For Later! Ever since New Year’s Eve, I’ve been obsessed with finding new places to find free or cheap graphic design elements. It started with one graphic deal my mom sent along to me, and now I’m up to like 200 gigs of stuff. Today, I’m sharing the results of my latest obsession with you! You don’t have to be a graphic artist or even a blogger to use these sites. They’re also perfect for scrapbooking, crafts, or even the PTO newsletter. Before getting started, let me just quick say: there are literally a million places to get “blah” free graphics. I’m not sharing those. This isn’t that sort of list. You can search for “free icons” or “free backgrounds” and come up lists galore with “eh” stuff with questionable origins, licenses and, in some cases, downloads. I’m sharing sites that offer freebies and deals from actual designers. Beautiful, high-quality graphics from people who know what they’re doing, with clear license information so you don’t get sued later. These sites also won’t give your computer a virus. *NO Affiliate links in this post. Not sponsored. Totally unbiased. I’m breaking it up into two parts. The first part features sites that are dedicated pretty much entirely to graphic design deals. They all have the same general “feel” to them. The second part features sites that aren’t dedicated to finding deals, but still either offer freebies on a regular basis or give you the tools you need to find incredible deals on graphic design elements. Also, while there are probably hundreds of these sites out there, I’ve only picked the ones that I’ve actually signed up for myself and use. I’m not going to share something with you if I don’t know if it’s trustworthy. Let’s start with the site that began this whole obsession: Design Cuts. They have an extensive “Freebie” section, which you can access in exchange for your email address. Yes, you need to sign up, but it’s worth it. Besides, once you create an account, all your purchases- freebies included- are right there to download whenever you have time. So you can sit on your iPad in the doctor’s office and browse, then go home and download. You’ll also want to check their newsletter, that’s how my mom found out about the $689 End-of-the-Year Freebie Bundle. I particularly like their themed freebie packs, like “Design a Vintage, Steampunk Postcard” freebie pack. These packs come with everything you need to fulfill the title’s promise. I came across DealJumbo when I bought something on CreativeMarket (below). The seller had mentioned that I could get their pack free over there, or pay $2 and get a few extras on the CM store. I paid the extra, but then checked out DealJumbo anyway. SO glad I did! They have a massive collection of freebies. Sign up for their newsletter and you’ll get access to exclusive freebies, plus weekly coupons so you can save on their already decent prices. Like DesignCuts, everything stays in your account, so you can grab now, download later. I just came across MyDesignDeals on my Facebook stream, of all places. I rarely pay attention to the ads, to be honest, but it caught my eye and I checked it out. You have to sign up for their newsletter to get access to the freebies. Once you do, you’ll be able to access the Designer Toolbox. There you’ll find three pages of free graphics, backgrounds, fonts, etc. About 12 on each page. They add new subscriber-only deals every week too. While they may not have as many freebies as some of the other sites, the stuff they do have is top quality. Their number one core value: if they can’t find you something beautiful, they won’t offer you anything at all. I highly respect that. These sites are similar to those above, so I’m not going to keep repeating the same thing. 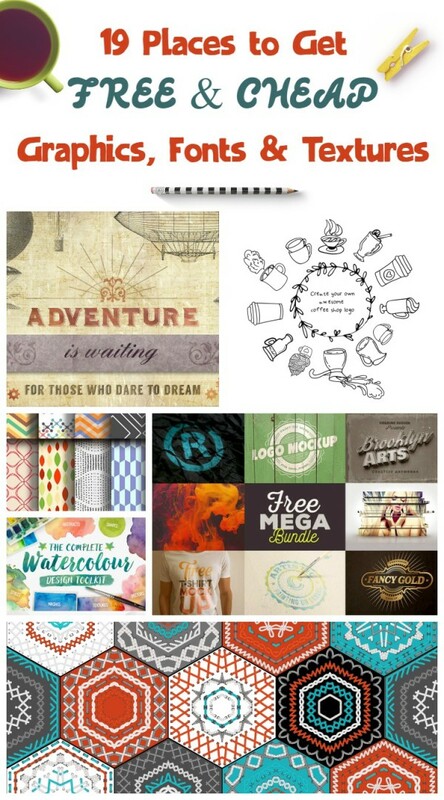 They all feature freebie sections, cheap graphic deals and a variety of other design tools. Most require signing up for their newsletter. MightyDeals: 5 pages of freebies, plus they also have plugins, software, ebooks, and other goods. The Hungry jpeg: 5 pages of freebies, plus a beautiful section specifically geared towards crafters. I came across this one in a post by The Pinning Mama on where to find free fonts. Creativity103: Sign up for their newsletter to get the password to download their free texture and backgrounds. I couldn’t think of a good title for this section, sorry. These sites either have free & cheap graphic design elements or are really great resources for finding unique, high quality graphics and deals. Creative Market is one of the most well-known design assets sites on the net, and it’s definitely one of the most well-organized. As far as freebies go, you’ll only find six at any given time, but those six change every week. With over 11,000 independent shops selling graphics, you can find pretty much everything here. As far as cheap graphics go, you can sort by price tiers and find some really pretty stuff for a few bucks. Like CreativeMarket, GraphicRiver brings together like a bazillion people selling their goods. I didn’t see a free graphics section, but you can find thousands upon thousands of really cheap graphic design elements. GraphicRiver is part of the Envato Market, so while you’re there, you can also browse PhotoDune for stock photography. While Deposit Photos is, for the most part, a paid stock photo site, if you sign up for a free account and their newsletter, they’ll send out free graphics in their newsletter each week. You usually get one free picture, one texture, one video and one editorial pic. If you’re looking for good stock pics and willing to pay, I’ve found them to be one of the best sites. I HIGHLY suggest signing up for the AppSumo newsletter. My mom told me about a Black Friday deal through them and I got 100 image credits for $39. They never expire and I can use them to download the largest file size (but not the vector). Speaking of AppSumo, they’re not really a design freebies site, but since we’re talking about where to find cheap and free graphics, I felt like they should be mentioned. They have different deals all the time. Many of these deals are for design goodies. If you click on “Browse” on their site, you can see a list of deals. TuwiDeals pulls in deals from other graphics deals sites. They don’t have a freebie section, but if you slide the price scale to 0, you will see the free deals. It’s a good place to stop if you’re short on time, don’t want to search every deal site and know what you need. It’s also fun to browse. Designer Chris Spooner of Blog.Spoon Graphics has a nice freebies section with some pretty unique designs. I love the overall soothing design of his site. After browsing shopping-mall like graphic design sites, his is like settling in to a quiet cafe for a cup of coffee (or tea, since I assume he’s a Brit based on his web address). When you go to Designrfix, you might be tempted to click on the Deals button to look for graphic design goodies. While you’ll find some stuff there, it’s not why I put it on this lists. Check out the Freebies and Graphic Design dropdown menus. That’s where all the good stuff is. I love the curated lists because I always find something that I wouldn’t have found on one of the deal sites. Plus the site has loads of other great content. Designious: I couldn’t decide whether to put this in the first section or down here. It has a freebie section and bundle deals, but it’s much different than the other sites. Also, if you want to use their artwork on your website, you need to get permission. That said, they have some REALLY beautiful stuff! Design Resources Search Engine: a custom search engine for finding design resources. Pretty self-explanatory. DeviantArt: I was on the fence about adding them, because I wanted this to be a “easy” list. Like “grab and go.” While DeviantArt has absolutely stunning art that you can use for backgrounds, you basically have to look at each picture, then look at the rules for it. It’s not a “search and grab” site. PixenDen: They have a freebie section, or you can join for $6 a month to get access to all their premium art. Between these 19 resources, you should have more than enough design elements to do everything from making awesome blog graphics to creating fun crafts for your home. If I find more, I’ll add them to the list. If you’re looking for a great place to find royalty-free photos, I suggest checking Where to Find Free Photos for Commercial Use over at Ellen Blogs. Do you know of any other great free or cheap high-quality graphic resources that I missed? Tell me about them in the comments! Wow, this is awesome. I am definitely going to check a few of these out. Love this! I am always looking for graphics like this for a little extra something. I will have to check these out. Thank you for sharing! There’s a lot of information here! At this time I’m good with everything I have but I’m going to bookmark this page when I need it. These are really nice. It pays to have a good source when it comes to graphics, especially when you’re maintaining a website or a blog. Thanks! They’re also great for stuff like school projects and crafts, by the way. My kid’s next project is going to rock! LOL. GIMP is on my list to learn how to use. I’ve had it forever, but never really learned how to use the different brushes and what not. I have a ton now, I just have to sit and play with everything. Thanks for this list of resources. I’m going to start going through these and bookmarking the once I can use! Bookmarked and using it from now on! THANK YOU! I needed something like this pretty badly! Awesome! I’m so glad I helped!! I check these sites every day. Definitely get the newsletters. I rarely read newsletters, to be honest, but I actually check these daily. I just got like $32,000 worth of graphic elements for $14 from an InkyDeals special. It is very cool. Thank you for sharing!!! Thanks for sharing this very awesome resource. Love this list! Free graphics? I love this. I have to check this out. This is a great resource for bloggers and entrepreneurs. I’ll have to add it to my resources file. This is a great list. Thank you for taking the time to put this together! This is an awesome list. I will be checking these out! These are some great resources. I’ll have to go through them and see what goodies are out there. Thanks for sharing! Very helpful tips I can use! I like pretty fonts. If there are a lot to choose from I have a hard time picking. Creative Market is by far my favorite place to find graphics! Hey, you should apply to be an affiliate and add your affiliate link in there. Make some extra $. I didn’t even know they had an affiliate program. Thanks for the heads up! Having extra graphic resources will definitely come in handy in the future. I just Pinned this one, saved to Pocket, and my computer. Also bookmarked and appreciated! It can be hard to find the right tools when your blog is about end of life issues and family.